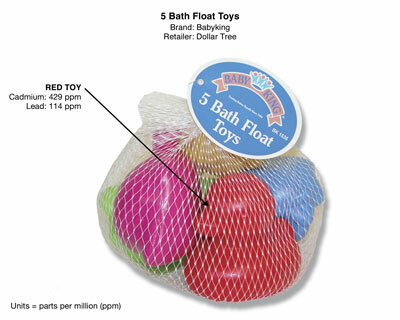 The recent recalls of toys for lead contamination has become a major concern for parents. Additional research shows that it is not just lead we parents should be concerned about. Healthy Legacy, an environmental group of Minnesota, worked in tangent with a few other organizations to test 1,200 children’s toys. The tests were used to detect not just lead, which was found in one third of the tested toys, but four other potential hazards as well; cadmium, arsenic, mercury and chlorine. Toys that test positive for chlorine likely contain PVC, or polyvinylchloride, which can contain phthalates. This chemical does not adhere to the plastic and is likely to leach off during play, or if chewed on. Phthalates are thought to be linked to reproductive, liver and kidney abnormalities. Over half of the toys tested were positive for chlorine. The good news is that both Target and Walmart are planning on phasing out products with PVC, but in the meantime these products remain on the shelves. Cadmium was found in some painted toys, PVC-based toys, lunch boxes and backpacks. Cadmium is a known carcinogen that, depending on the dose, can cause developmental defects as well as bone loss and altered behavior. In acute doses, the chemical can cause death. There are currently no U.S. restrictions on cadmium in children’s products. Arsenic is generally used as a wood preservative and may also be found in textiles and fabric dyes. It is also a known carcinogen and is linked to developmental disorders. The toy industry has a voluntary, but not enforceable, standard to reduce contamination to no more than 25 parts per million. Mercury is used in inks and adhesives. It is sometimes used as a catalyst to form polyurethanes. Mercury is toxic to the nervous system, but was only found in low concentrations for items like bath toys and vinyl backpacks. 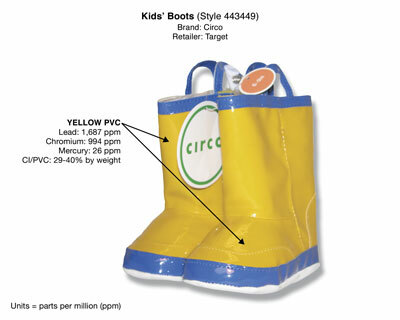 The biggest risk, assumed, is the release of mercury to the environment once the toy or item is discarded. To view the test results of 1,200 common toy brands, visit HealthyToys.org. The web site also offers a tool for you to request a specific toy to be added to their tests as well as a database of the test results that you can access from your mobile phone while shopping. What a great idea to have mobile phone access. That will help a lot!